The Anchorage Hillside could be facing a wildfire disaster this summer. Here's how to protect yourself. Forester John See and his colleagues at the Anchorage Fire Department are trying to prevent a catastrophe. Parts of the city are vulnerable to a wildfire that could destroy whole neighborhoods — the kind of disaster becoming more common across the West. Earlier this month, fire swept through Fort McMurray, Alberta, leveling 2,400 buildings in the city of 80,000 and forcing a complete evacuation. Residents still can't go back. When I asked Anchorage Fire Chief Denis LeBlanc if something like that could happen here, I expected some reassurance. I didn't get it. "All of the factors that would fan the flames of a conflagration exist," LeBlanc said. "It absolutely could happen here." But homeowners can protect themselves, at least to some degree, by creating defensive space. Firefighters will inspect your home to tell you how to make it safer from wildfires. The municipality even picks up part of the cost of removing coniferous trees too close to houses. 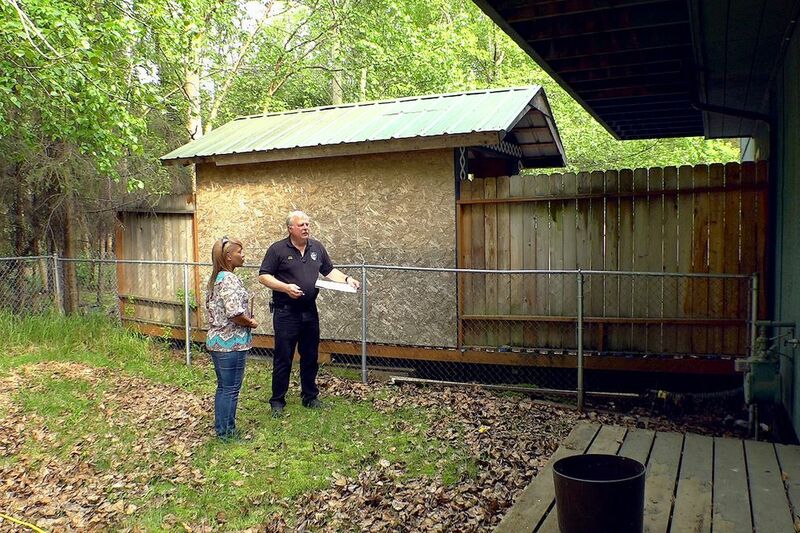 ADN multimedia journalist Scott Jensen produced a video of one of those inspections by See last week. You can learn most of what you need to know by watching that and by following the advice provided online and in handouts from the Fire Department. It's the sort of chore that's easy to put off, but as Alaska dries out, the snowpack shrinks and summer gets hotter and longer, time may be running out. The wildfire season started in February this year. Alaska wildfires have been getting larger, more numerous and more severe. The fingerprint of the changing climate shows up clearly in forest fire statistics in Alaska and across western North America. A recent report showed that Alaska's increasing fire size, season and geography over the last 65 years closely tracked increasing temperatures. That report came out last June, before the numbers were in on 2015, Alaska's second worst fire year ever, with 5.1 million acres burned. Almost as many acres burned in the Lower 48. Wildfires destroyed about 3,000 structures in California. This year is off to an alarming start. The Fort McMurray fire has been called the costliest natural disaster in the history of Canada. See said his children got caught up in the evacuation as they traveled across Alberta, although they were OK and found their way through. See's deep, calm voice and slow style of speech would be a steadying influence in any crisis. But he is working hard to sound the alarm for Anchorage residents about what could happen here. At the eastside house where Jensen filmed the video, See found a stand of black spruce within 30 feet of a back wall. The department recommends 80 feet to stands of conifers. Black spruce, left over on the landscape from before Anchorage developed, burn hot and fast. They are adapted to use fire to reproduce, with cones that need heat to open. "It would be like a roman candle going off," See said. "This is a high-risk situation." But, he added, "It's fairly common to come up with situations like this." Buildings most at risk stand next to greenbelts or in neighborhoods that are thickly wooded with native vegetation, especially on slopes. That describes the Anchorage Hillside. But much of the city is safe. A typical subdivision house surrounded by lawn faces little wildfire hazard. Deciduous trees — those with leaves — pose less danger than conifers. Birch and other hardwoods are OK as close as 15 feet from a house. The eastside duplex we visited with See, in the flatlands, wasn't at risk of a mass conflagration, he said, but needed tree-thinning work like other houses near parks and undeveloped land. Kids or homeless campers could easily start a fire in greenbelt woods on a hot, dry afternoon that would race to houses without defensive space around them. The danger of mass fire centers on the Hillside, where computer modeling shows that the shape of the steep topography—areas that See called chutes and chimneys—could power fast, uncontrollable spread of fire from house to house. Residents in those areas should follow all the tips the department offers. You can do much of that using the simple checklist online. Sign up for an inspection by calling See (907-267-4902) and leaving a message with your name, address and phone number. The city has matching funds of up to $500 for a single residence, with the amount depending on the size of the lot, to pay for professional tree removal that the fire department recommends. I think the city also needs to make its own investment. When U.S. Sen. Ted Stevens was still in office, he provided money for thinning trees and cutting firebreaks on the Hillside with a congressional earmark. We can't expect that kind of free money anymore but averting a disaster is worth spending our own money. Finally, let's stop pretending these catastrophes are acts of God. The climate is warming because of the carbon emitted by human beings burning fossil fuels. People all over the world are paying the price, with rising seas, droughts, crop losses and extreme weather events. Here, we're paying by facing wildfires that threaten our city, losing our trees to pests, losing our winters to thaws and so much else, documented in these pages every week. We're paying a lot for climate change. As it grows worse, we will pay much more. So do take care of your house and your family. Create defensive space; move your woodpile away from your walls; store gasoline, lawn mowers and snowmachines in a shed, not under your eaves. Pick out the papers and photographs with which you will run out the door if fire is sweeping over your neighborhood. But also think about how you can save energy and support policies to reduce carbon so the next generation doesn't face problems that are even worse. Charles Wohlforth's column appears three times weekly. Email him at cwohlforth@alaskadispatch.com.